Drain the tofu and gently press between layers of paper towels to remove excess moisture or press in tofu press for 10 minutes. In a bowl, combine the peanut butter, soy sauce, lime juice, garlic powder, and Sriracha. Add the tofu, bell pepper, green onion, and cilantro. Stir with a fork until well mixed and the tofu is crumbly. 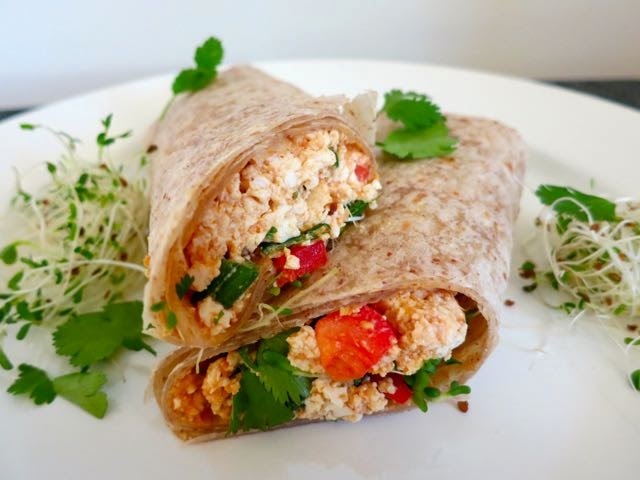 Place a portion of the tofu mixture in the center of a tortilla wrap, top with sprouts, and roll up the tortilla. Repeat with remaining tortillas.